Despite significant progress in recent years, the evolution of commons over the long run remains an under-explored area within commons studies. During the last years an international team of historians have worked under the umbrella of the Common Rules Project in order to design and test a new methodology aimed at advancing our knowledge on the dynamics of institutions for collective action – in particular commons. This project aims to contribute to the current debate on commons on three different fronts. Theoretically, it explicitly draws our attention to issues of change and adaptation in the commons – contrasting with more static analyses. Empirically, it highlights the value of historical records as a rich source of information for longitudinal analysis of the functioning of commons. Methodologically, it develops a systematic way of analyzing and comparing commons’ regulations across regions and time, setting a number of variables that have been defined on the basis of the “most common denominators” in commons regulation across countries and time periods. In this paper we introduce the project, describe our sources and methodology, and present the preliminary results of our analysis. Twenty-five years since the publication of Governing the Commons, the fundamental insights of Elinor Ostrom still retain much of the originality they exhibited when first published in 1990 (Ostrom 1990, 1992). Overtly challenging well-established literature in the realm of the social sciences (Gordon 1954; Olson 1965; Hardin 1968), her basic message was to assert the possibility of robust human cooperation. According to her, self-governance, with community involvement and the tailoring of rules to local conditions, lies at the heart of successful cooperation and resource management – a revolutionary statement in the midst of the ‘institutional panaceas’ that dominated policy making during the 1980s and 1990s (Ostrom 2010). Subsequent research has confirmed Ostrom’s basic intuitions (Cox et al. 2010) – as the award of the 2009 Nobel Prize in Economics publicly acknowledged for the wider academic community and the general public. Following the path pioneered by Ostrom, much of the work on the collective management of natural resources has often relied on on the close analysis of a number of more or less contemporary case studies in different parts of the world (Poteete et al. 2010). In recent years, field and lab experiments have also become a fundamental component of the commons scholar’s toolbox, as well as agent-based modeling and computer simulations (Janssen et al. 2011, 2015). As a consequence of the increasing amount of literature, our knowledge on which are the main explanatory factors behind robust cooperation has greatly expanded. The very basic outline of this literature is evident: commons’ performance (however measured) becomes the variable to explain, with a number of internal and external factors (rules and institutions among them) being treated as exogenous explanatory variables. However, questions on the emergence and change in these collective arrangements have not received much attention. If problems of resource over-exploitation (or free-riding more generally) represent the first-order social dilemma faced by commoners, the design, enforcement and modification of commons (or coordination mechanisms more generally) represent the second-order and equally important one (Dawes 1980, Kollock 1998). How and why did these arrangements emerge? How and why did they change over time? Which rules changed over time in reaction to which internal and external factors? If the resource stock diminishes, do commoners then adapt the appropriation rules? And what happens if the group of commoners increases: are membership conditions made stricter or is the resource allocation adjusted? As historians, our approach is certainly different to much of the previous literature: we take institutions as the main dependent variable, and try to account for change in them by looking at a number of factors. In other words, we “endogeneize” institutions rather than simply taking them as exogenous forces. The effort of collecting, classifying and comparing the regulations produced over time by commons across pre-industrial Europe lies at the intersection of a number of debates in the fields of institutional analysis and economic history. First and foremost, the Common Rules project aims to contribute to discussions of institutional change – particularly in collective action institutions. As we have indicated, much of the literature over the past years has been mainly focused on explaining the determinants of long-standing cooperation and robust common-property regimes by resorting to a diversity of methodological approaches (Axelrod 1984; Ostrom 1990; Henrich et al. 2004; Nowak and Highfield 2011). Despite valuable progress in this front, we still lack enough insight into how such drivers (institutions and rules among them) evolved over time. Admittedly, a number of works have explicitly dealt with institutional change in the commons (Ensminger 1996; Haller 2010). Even Ostrom herself devoted a chapter in her 1990 book to analyse how some of the institutional arrangements she studied had emerged and changed over time. In our opinion, however, most of these studies have oscillated between being either theoretical exercises or more descriptive works – a common feature with those works dealing with institutional change more in general (North 1990; Alston et al. 1996; Greif 2006). Also importantly, when describing the process of rule creation and change, scholars have usually focused on relatively short time horizons – a situation largely explained by the unavailability of empirical evidence. The need of both a more systematic study of institutional change and an explicit attention to longer time horizons is evident. The main goal of the Common Rules project is precisely to advance in that direction. First, it provides a great deal of new historical evidence about the process of rule change in commons across Europe. But, perhaps more importantly, the project develops a methodology which facilitates institutional analysis and makes possible comparisons both across communities and over time. Beyond this immediate goal, our project is also informed by ongoing discussions in the field of economic history. Since the publication of the seminal work by Douglass North, the right balance between individual property rights and a strong state in long-term development has become a favorite topic among economic historians (North and Thomas 1973; North 1990; Acemoglu et al. 2005; Greif 2006; Ogilvie and Carus 2014). In opposition to this market-state dichotomy, in recent years several scholars have highlighted the role that self-governed communities could have played in the institutional development of Europe (Greif 2006; De Moor 2008; Van Zanden 2009). From their perspective, local communities would have been a particularly important device for coordinating and protecting property rights during pre-industrial times – in a time when a powerful – enough state was simply not yet there. Merchant and craft guilds (Epstein 1998; Greif 2006; De Moor 2008), communes and other local self-governed institutions (Van Zanden and Prak 2006; Stasavage 2014) or commons (Casari 2007; De Moor 2009) are the main subjects of these recent studies. The claims have gone so far as to suggest that a high density of such communities in all realms of social and economic life would have been a distinctive feature of western Europe when compared to other regions of the world (China, Japan, the Islamic world) (Putnam 1993; De Moor 2008; Van Zanden 2009). By studying how commoners were able to organize and regulate cooperation in the exploitation of natural resources during pre-industrial times, our project also sheds light on what was arguably a distinctive institutional feature of Western Europe before 1800. Traditionally, the study of commons by historians has been dominated by a concern about the consequences that the collective exploitation of resources had in the social and economic realms – this is the third and final debate our project critically engages with. Although the consensus among historians held that commons had been harmful for economic efficiency (a finding in line with much of the work of classical economists), a number of studies started to reassess this view – suggesting that the longevity of such collective arrangements could respond to reasons other than purely distributional ones (McCloskey 1972; Grantham 1980; Allen 1982; Lana 2008). Despite these more positive views, the focus, however, still remained on the consequences of abolition of commons. Only with the reassessment that collective action theory witnessed from the 1980s (Axelrod 1984; Ostrom 1990; Runge 1992), have hints of a more comprehensive approach to historical commons started to become visible. As a consequence of this gradual shift, questions such as what the driving forces were behind the expansion of commons in western Europe from the late medieval period onwards, how communities were able to maintain these collective organizations, or which adjustments and changes they witnessed throughout time are becoming increasingly attractive for economic, agrarian and environmental historians. To this date, however, the number of works addressing these questions has remained relatively small (Van Zanden 1999, De Moor et al. 2002; Casari 2007; De Moor 2009; Rodgers et al. 2011; Laborda and De Moor 2013; De Moor 2015; Grüne et al. 2015). With our project, our aim has been to push these recent efforts among historians forward – initiating a line of research which systematically sheds light on the internal workings of what until recent times has largely remained the ‘black box’ of historical commons. Before describing the sources and methodology, word of caution is necessary on the premises upon which our work builds. The notion of ‘institutions’ used in this article brings together the definitions of Douglass North (‘the humanly devised constraints that shape human interaction’, North 1990, 3) and Elinor Ostrom (‘the prescription that humans use to organize all forms of repetitive and structured interactions’, Ostrom 2005, 3). We are well aware that within the social sciences the concept of ‘institutions’ is not straightforward. In recent years definitions have proliferated and we are somehow required to choose among competing candidates (North 1990; Ostrom 2005; Greif 2006; Hodgson 2006; Kingston and Caballero 2009).3 In this article, we therefore understand institutions as rules. Ostrom, in turn, defines ‘rules’ as ‘the set of instructions for creating an action situation in a particular environment’ (2005, 17). Moreover, our understanding of institutions puts the weight on formal constraints, that is, on the formally enacted, usually written rules that are expressed in legislation, administrative regulations, and court decisions (as Ostrom puts it in her 1990 book) rather than on other types of constraints – such as religious commands, social customs or moral precepts. Given that our main documentary evidence consists in the written regulations produced by commoners over time and enforced by local self-governing bodies, our stress lies more in ‘rules-in-form’ rather than ‘rules-in-use’ (Ostrom 2005). In this sense, we are aware that not being able to capture other types of informal rules or to observe actual behavior in these historical common-property regimes impairs our ability to fully understand the dynamics of rule innovation an institutional change. The limitations of historical research and the sort of empirical evidence historians build upon become evident here. In front of these reservations, we still find very good reasons to study rules-in-form. We often like to draw an analogy with a fundamental debate in the economics discipline. Despite the success of rationality assumptions to predict a great deal of outcomes, there still is a non-negligible gap between rational behavior (as predicted by economic rationality) and real behavior (as observed in behavioral experiments) as a consequence of the existence of cognitive biases and other factors (Simon 1983; Kahneman 2011). Rational behavior, however, still represents a valid benchmark against which to assess observed behavior: if we have no clear guidelines regarding the best an individual can do when making choices, how can we then assess the choice he has eventually made? We see useful parallels between this reasoning and the intrinsic limitations associated to the use of written records: although it would be naïve to think that a gap between rules-in-use and rules-in-form did not exist, written regulations are still a very good indication about what the commoners deemed to be optimal in terms of exploitation and management given their individual interests and the distribution of bargaining power within the community. In that sense, our research on the process of rule innovation could be better read as a investigation of how benchmarks about the optimal activity of common-property regimes evolved over the long run. A second point of caution relates to our definition of institutional success. How success is defined within the context of institutions for collective action has been subjected to considerable discussion and it is not our intention to directly engage in this debate here (Conley and Moote 2003; Agrawal and Chhatre 2006; Pagdee et al. 2006; Hajjar et al. 2016). All the case studies included in our analysis share a common feature: their longevity. They all were in place for several hundreds of years. Their degree of resilience was therefore considerably high. Focusing on institutional longevity as a measure of institutional success has however received criticisms from a number of authors (Ogilvie 2007; Ogilvie and Carus 2014). After all, the survival of institutions throughout time could be largely explained by distributional considerations – with the group of individuals interested in the perpetuation of an inefficient institution holding a share of bargaining power considerably higher than the rest (Acemoglu et al. 2005; Ogilvie and Carus 2014). Beyond longevity, however, the commons analyzed in the project exhibited the active participation of the commoners in their management and governance mechanisms. Moreover, all the communities fulfilled most conditions of the so-called ‘productive rule evolution’ as originally formulated by Ostrom (2014). Most importantly, the resource basis of the communities (grasslands and meadows, arable land, forests) did not suffer considerable losses over time – being able to support the reproduction of the communities. If one of the main goals of historical commons was precisely to adjust exploitation levels to varying socio-economic and environmental conditions in order to avoid the exhaustion of the resources, their accomplishment is evident. Taking all this together (institutional longevity, a high degree of participation, environmental sustainability, reproduction of the human community), we are confident that our selection of case studies certainly captures a set of institutions whose satisfactory (if not successful) performance deserves further analysis. Rather than focusing all our efforts in the study of a specific region, our interest in comparative research pushed us to expand the geographical boundaries of our project to a European level. To those ends a set of commons located in the Netherlands, England and Spain for which enough historical regulations had survived was first identified. The Dutch commons in our database date back at least to early modern times. Most of them were already mentioned as a common in the late Middle Ages. The term ‘mark’, originally indicating the boundary stones that demarcated the limits of the common land, eventually came to refer the institutional arrangement behind its management and governance (Van Weeren and De Moor 2014). Membership of these organizations exclusively encompassed the users of the common resources – basically peat as source of fuel and grass for the cattle. The prevalence of these corporations seems to have been particularly high in the eastern Netherlands. All the Dutch commons included in our analysis were located in this region, which restricts substantially the degree of socio-economic and environmental variation. During much of the pre-industrial period this region was characterized by low levels of urbanization, market pressure and population density, with a landed nobility leasing out their properties to farmers fundamentally focused on subsistence production (Van Weeren and De Moor 2014). The assembly of the mark, comprising all the users and usually presided over by an elective or noble markerichter, was the body in charge of discussing and passing changes in the regulations. Monitoring by specific members and sanctioning mechanisms were designed to deter free riders from breaking the rules. Dissolution of most of these commons during the nineteenth century was closely related to their worsening financial situation. Some cases in our selection managed however to survive the effects of the nineteenth century legislation. The earliest records of the English cases are younger than the earliest records of the Dutch ones. Although the oldest example dates back to 1511, the earliest regulations of the other cases date from the end of the sixteenth, and in most cases from the seventeenth century. The legal context of common land in England differed from that of most commons elsewhere in Europe in that it was privately owned land over which third parties had use rights. The common land of the English case studies had the status of ‘manorial waste’, that is, waste ground belonging to a manor or landed estate, ownership of which had been vested in the lord of the manor since 1235. Contrasting with the Dutch cases, an English common was therefore not an institution as such; nor was it governed by an organization specially created and solely responsible for the common. A common’s regulation was part of the governance of the manor to which it belonged. The local institution which made regulations governing the exercise of use rights over common land was the manorial court, a seigniorial court with a jurisdiction limited to the boundaries of the manor. Called by the lord of the manor and presided over by his steward, the court generally required the attendance of all tenants of the manor, from whom was drawn a jury who determined cases and formulated rules. The rules formed a body of customary law which was particular to that manor – it was lex loci – and many rules related to the use and exploitation of commons. Most manorial courts remained active until the eighteenth century, some continuing to make rules into the nineteenth century, but most courts had ceased to meet by 1860. The oldest preserved bodies of rules of the Spanish cases included in this selection (those concerning Sierra de Lokiz) date from the fourteenth century but most of them date from the sixteenth century (Laborda-Pemán et al. 2016). References in these documents to even older customs suggest that the origins of these commons must be dated as far back as the Middle Ages. Spanish commons are different from English and Dutch commons in the sense that they were explicitly and legally linked to the local political organization – located within the boundaries of a village, subjected to exploitation by all its vecinos (inhabitants enjoying political rights in the village organization) and regulated by all of them via their participation in the village council. All these villages are located in the northern region of Navarre, between the highlands of the Pyrenees and the lowlands of the Ebro valley – an independent kingdom until 1513 when it was conquered by the Crown of Castile. Despite being located relatively close to each other, differences between the villages in their environmental and socio-economic conditions are significant. Relatively isolated from urbanization and market pressures, the mountainous communities in the valley of Roncal largely relied on cattle farming (sheep, goats, cows) for their subsistence (Idoate 1977; Caro Baroja 1995; Larrea 2005). In the villages around the city of Estella the climatic and environmental conditions made possible a more balanced distribution of cattle farming and grain cultivation activities (Floristán Imizcoz 1982). In all communities, however, commons provided grass and water for the cattle as well as some basic inputs for the peasant economy (e.g. wood for fuel and building). From the nineteenth century onwards, villages were usually assimilated to municipalities. Three of the commons in the Spanish sample exhibit a more supra-local character – with their exploitation being shared by several villages. All these three intercommons were governed by juntas (boards) appointed by the councils of the different villages with use rights on the intercommon. For this study we have only taken into account the regulations approved before the end of the nineteenth century. Circumstances around commons changed over time, causing the need for new rules or for the adaptation of existing ones. Rule change however could not be implemented at will by those in charge of the daily management of the common. In the Dutch, Belgian and Spanish commons, when rules needed to be changed, this had to be done with the approval of the assembly of commoners or neighbors, while in England such changes were made by the seigniorial manor court. Although emergency meetings were foreseen in case of extraordinary circumstances, general meetings of the assembly (or village council in the Spanish cases) were usually organized on fixed annual days. The mandatory attendance of all members who were entitled to vote is suggestive of the importance that these meetings had for the satisfactory management of the common – a feature shared by all the cases analyzed. Unauthorized absence at these meetings was punished. The criteria on which decisions were made are not usually made explicit in the sources. In some cases there are indications of a simple majority of votes being sufficient; in others unanimity seems to have been the general rule. As Table 1 shows, the frequency of rule changing varies not only between countries but also between commons in each country. Admittedly, we cannot entirely rule out the possibility that a number of regulations for some commons is missing. However, the figures seem to suggest that commoners could have used one of two strategies: either they had a relatively high meeting frequency, resulting in only a limited number of rule changes per meeting, or they preferred to have a limited number of meetings, this resulting however in a considerably larger number of rule changes each time. bThe figures have been calculated from the earliest surviving regulation to either the date of dissolution or (where the common remains in existence) the year 1925, which effectively saw the end of most manorial courts. Given the nature of the evidence, it is important to stress that the use of these records does not come completely free of problems. The basic limitations associated to this evidence are its written nature (and the subsequent inability to capture more informal aspects) as well as the disparate survival of the records throughout time – intrinsic problems of any sort of historical research. With relation to the first concern, we refer to our discussion above about the distinction between ‘rules-in-use’ and ‘rules-in-form’, and the still valuable insights that the analysis of formal regulations can provide us. With regard to the second problem, there is not much we can do but acknowledging the existence of incomplete written records and being cautious in our conclusions when suggesting patterns of rule innovation over time. The emergence and persistence of written sources in small communities like the ones analyzed built upon two factors: a supply of scribes and a demand by people able to read or, at least, interested in paying for those services ir order to defend their collective property rights before the courts. So not all the rules were written and not necessarily all the written rules were preserved. Given these evident limitations, the communities analyzed were chosen on the basis of the existence of sufficient archival records. Once they had been selected, all the regulations we could find both in archives and already published sources were gathered. Beyond this, it is also important to stress two points. First, given the antiquity of many of the records retrieved, we faced a certain trade-off between antiquity and completeness: the farther back in time we went, the more unlikely was to be able to build complete series of regulations. Second, the incompleteness of the regulations’ time series varies per region. The insights regarding the process of rule innovation we can obtain are not necessarily limited per se given the nature of the evidence used – but are largely dependent on the particular region studied. Once commons’ regulations had been collected, the next step was to classify the rules they contained according to a standard methodology that made possible subsequent comparisons both over time and across communities.5 The process of codification consisted in two subsequent stages: first the development of the codebook and the dataset structure themselves, and then the process of data entry. In a series of meetings, the members of the project agreed on which were the main categories that the dataset should encompass. The specificities of the historical documents we work with pushed us to develop a codification scheme ex novo rather than relying on pre-existing contributions such as the ADICO syntax (Ostrom 2005). The discussions and agreements during these initial meetings eventually materialized into the drafting of the codebook (see the Appendix to this paper) and the design of the online dataset. On the dataset structure was available, the data entry itself began. Since the regulations collected diverged considerably with respect to the institutional, historical and linguistic contexts in which they were embedded, it was agreed to distribute the process of data entry according to native language criteria.6 In order to reduce as much as possible the discrepancies, another set of meetings took place so all the contributors could share their concerns and agree on a common ground – which resulted into certain decisions on codification (as shown in the final version of the codebook). In some cases, especially the oldest documents, regulations were just handwritten by a notary in front of the commoners or the village council. In other cases, printed copies were produced. Usually, regulations were not drafted according to a standard structure. Their production by official notaries introduced however some regularities in the way the text was organized. The regulations usually start with an indication of the place and the date in which the meeting of the commoners, the manorial court, or the village council took place. After a preamble, the rule content itself follows. All the regulations were transcribed or copied to the database and translated into modern-day English. As it is easily visible in Figure 1, regulations were organized in different paragraphs or chapters – with each paragraph usually dealing with a similar topic. These chapters correspond to what we have called, for the purpose of our analysis, original rules. But very often each of these chapters (or original rules) usually contained more than a single precept. Since our interest lies in the specific regulatory statements ordering behavior and their change over time, the focus of our classification and subsequent analysis was on those individual clauses and not necessarily on the more general chapters.7 For the purposes of the analysis, we have therefore broken each chapter or original rule down into its respective component rules – which we have called individual rules. Individual rules, which are the basic unit of our analysis, were entered and codified separately in the dataset. Hence, in the database there is usually a one-to-many relationship between original and individual rules – with a minimum of one individual rule for each original rule. Handwritten regulations of the mark Berkum, the Netherlands. Rule category. This label indicates whether an individual rule relates to access, use, governance or management. Access rules specify who is entitled to use the common and under which conditions; rules relating to use give permission, state prohibitions, or impose obligations concerning resource exploitation by the commoners. The codebook allows further classification of the type of resource regulated (animals, infrastructure, vegetation, water, etc.) as well as its location, amount, exploitation season, and technology. Governance and management rules are concerned with non-exploitative activities: governance rules usually deal with the appointment of and the tasks of officials, while management rules regulate the activities of the users themselves in areas other than the exploitation of communal resources. The specific areas dealt with by management or governance rules (finance, meetings, monitoring, etc.) can be also indicated in the dataset. Rule form. This label indicates whether the content of the individual rule is formulated as a permission, an obligation, a prohibition or, alternatively, contains an appointment. Rule sequence. This category specifically relates to the process of rule innovation in a common. When passing new regulations, commoners could simply decide to repeat an individual rule that had been already formulated without introducing substantial changes or, more frequently, to adjust some of its features in the light of changing circumstances. In the case of rules introduced ex novo without any recorded precedent, institutional innovation is even more evident. Finally, commoners might agree explicitly to cancel rules made in earlier times. Under this label, all these possibilities are recorded in the dataset. Rule party. This label indicates whether the content of the rule is aimed at everyone, at people other than commoners, or exclusively at commoners themselves. In the latter two cases, our codebook also allows for a more detailed delimitation of the rule recipient, e.g. a specific group or individual, or a specific official or position within the organization. Offending and suffering parties. These categories identify respectively the parties who commit the offence (non-members, members, officials, any person) and those who suffer most from it (the whole community, a group of individuals, a single person, or specific authorities). Graduated sanction. This category explicitly captures the existence of graduated sanctioning in robust institutions for collective action, a feature originally identified as significant by Ostrom in 1990. According to her, in resilient institutions for collective action rule breaking is not unavoidably subjected to harsh and fixed punishment. In order to accommodate the possibility of commoners’ mistakes or situations of pressing need, sanctioning would usually follow a graduated scheme with first infractions of a rule being subjected to relatively mild treatment but recidivism being eventually punished with exclusion from the community. Our coding scheme makes possible to indicate whether such a graduated scheme is foreseen for a specific offence, with sanctions substantially increasing after the first, second or third time an individual rule is broken. Differentiated sanction. In certain cases, the sanction for the same offence was different depending on the timing of the infraction or the status of the offender. Our codebook captures this aspect by coding according to whether there is some time-related differentiation, since sanctions could be increased in case of offences committed at a specific time (e.g. at night or at a specific time of the year), offender-related differentiation, whereby the severity of the sanction depended on the position the offender held within the community (e.g. officials might be punished more severely than others). Harm type. This label identifies whether the infraction causes a direct harm to individuals (e.g. violence against guards), animals (e.g. contagion by infectious diseases) or, more often, resources (e.g. overgrazing grasslands). Additionally, it also makes it possible to indicate whether the offence reflects anti-social behavior, is a consequence of negligence and omission rather than active misbehavior, or, conversely, is the result a desire for unjustified profits. Sanction type. Offences could be punished with very different types of sanctions, ranging from the payment of a fine (either monetary or in kind) or economic loss (loss of user rights, confiscation, impounding or destruction of part of the offender’s assets) to political sanctions (loss of office, or exclusion from the assembly, the common or the village) or even social and physical ones (public shaming, corporal punishment). In this category, the specific type of sanction can be recorded. For monetary sanctions, the amount and unit of the fine can also be indicated. Sanction allocation. In the case of sanctions consisting in payment of a fine, regulations usually foresaw the subdivision of the revenues among different parties – normally the accuser or guard on the one hand and the community authorities on the other, in some cases including higher levels such as the king or his representatives. Rewarding law-abiding commoners when they reported offenders was one of the ways the management of the commons sought to enhance monitoring by the commoners themselves. Such amounts were usually distributed between the parties according to specified proportions. Both aspects (the different parties and their respective share) can be recorded in our dataset. The total number of original rules collected from all the regulations analyzed in our 25 case studies is 3331. Out of all these original rules, a total of 5427 individual rules has been subsequently derived – from which 3280 correspond to nine Dutch commons, 1684 to nine Spanish commons, and 463 to eight English commons. As observed, the number of English rules is relatively small (see Table 1). This difference is mainly due to the fact that in England only those decisions explicitly endorsed by the manorial court in its verdicts were subsequently recorded in the court rolls; there is evidence from many English manors for systems of informal grassroots regulation which were not recorded in writing. In the Dutch and Spanish cases, by contrast, no separate judicial body mediated between the process of rule creation and its enforcement – with the commoners’ assembly taking decisions autonomously and probably giving rise to a much higher recording frequency. Access rules. As Table 2 shows, the share of rules regulating access was relatively small in all the commons analyzed – independently of their geographical background. Although rules specifying who was entitled to use the common resources are likely to be among the first regulations drafted by communities, their contestation and adjustment does not seem to have taken up much of the effort of the commoners’ assemblies. The immediate explanation for this would be that access rights to the common had become relatively clear already in earlier times, so that repetition or adjustment were rarely necessary. An alternative hypothesis would suggest that, given the constitutional nature of access rights, their regulation was overseen by bodies other than the assembly of commoners itself. Overview of Individual Rules by Category (% Total Rules). A very similar situation is observed with the other type of access rules – those determining the geographical limits of the common-pool resource itself. The number of rules dealing with border conflicts is relatively small, suggesting again that either the physical boundaries of the commons remained stable or, alternatively, that any modification was of such a foundational nature that it was not explicitly reflected in the documents produced by the local communities themselves. The English situation is relevant here: since common land in England belonged to the lord of the manor, the boundaries of the commons were in turn determined by the boundary of the manor. Numerous disputes between manors over common land boundaries are documented during the sixteenth and seventeenth centuries, leading to clarification of rights and clearer definition of boundaries. However, given their nature, these changes were recorded in other texts (legal degrees, charters etc. ), separate from the bylaws regulating the use of the common. Use, management and governance. Remarkable differences between countries are visible in the preponderance of rules concerning governance and management (see Table 2). Whereas in the Low Countries governance was a central aspect of the regulations analyzed, its importance seems to have been considerably lower in the Spanish and English cases – although, in any case, high variation across commons within each country should be noted. For their part, rules on management are almost absent in the English cases but are an essential part of the regulations of the Spanish and Dutch ones. In any case, what is evident is that most regulatory efforts across commons in all the three countries were focused on constantly adapting use rules to changing circumstances. Extractive activities and the threat that they could eventually represent to the community always remained the basic area of concern. In the English cases, over three-quarters of all the rules fall within this category and for the Dutch and Spanish cases they also represent a major part of the regulations. Rule form. Significant differences between countries also emerge with respect to rule form. English rules mostly exhibit a prohibitive nature and contain hardly any decisions to appoint new categories of officials. Regulations of both Spanish and Dutch commons, on the contrary, encouraged cooperation mainly via permissions and obligations. Such a contrast, particularly the dissimilar importance of permissive rules, is likely to reflect the more top-down structure of manorial courts (run by the manorial authorities and with the lord’s steward controlling the agenda and working within a national legal framework of property rights – see Winchester 2015) in opposition to the more bottom-up features that characterized rule-making in the other two countries, where assemblies of commoners or neighbors assumed the leading role. Rule sequencing. The ability of regulations to survive over long periods of time is partly confirmed by figures on the sequence of rules. Particularly in the Dutch case studies, some rules only appear in the regulations once – never to be repeated or mentioned again. Although one could suggest that the clarity and the adaptation of these rules to local conditions from the very beginning explain the lack of subsequent adjustment, it is more plausible to hypothesize however that these rules only applied to very specific situations or periods, after which they were no longer needed. Overall, however, the small proportion of rules being spelt out for first time is explained by the existence of earlier regulations which have not been preserved. When transcribing Dutch and English regulations, it was common to indicate that this or that rule had its origins in an unpreserved text from an earlier date. Rule annulment hardly ever occurred: it is likely that regulations which fell into abeyance or were displaced by new ones ceased to be mentioned in subsequent regulations rather than being explicitly annulled. Thus, most rules represent adjustments of previously formulated ones; simple repetition of an existing rule was, however, much less frequent. Sanctioning. The type of offences deserving of punishment have been analysed in relation to the offended party, the offender, and the sort of damage involved. Direct damage to resources, as well as the offender obtaining an unjustified profit, were the most common types of infringements across communities in the three countries. In most cases, the main victim of the infraction was deemed to be the group of commoners as a whole rather than a specific individual – an evident indication of the collective character of most of the resources protected by the regulations. Most offences were committed by commoners themselves rather than by people from outside the common. Although this suggests that threats to sustainability fundamentally came from members’ behaviour, it should be borne in mind that the predominance of insiders as offenders is more likely to reflect the limited jurisdictional power of the community institutions whose records are the subject of this analysis. The fact that offences by outsiders could be subjected to monitoring and punishment to a much lower degree than was the case for offences carried out by members of the community would have translated into fewer mentions in the regulations. Graduated sanctioning was only used by Dutch commoners and even there only to a very limited extent. There, the level of fines for a second offence was increased slightly in comparison with the sanction for a first-time offence. It is striking that the number of rules related to third-time offences is considerably lower – perhaps indicating that warning twice could have been sufficient in most cases. Much more frequent than increasing fines in cases of recidivism, was the differentiation of sanctions according to the time of the day or time of the year the offence was committed. Controlling the commoners. Our dataset offers interesting insights into the different mechanisms designed by commoners in order to prevent free-riding and resource over-exploitation. Van Weeren and De Moor (2014) have analysed in detail the monitoring and punishment practices in a subset of four Dutch commons. Van Weeren and de Moor document in detail how commoners consistently resorted to monitoring by appointed officials, social control on the part of commoners themselves, as well as diverse punishment strategies. In general, their analysis stresses two features frequently found when analysing historical commons: the existence of methods other than simple punitive strategies (even if graduated) in order to prevent free-riding as well as the central role performed by commoners themselves in controlling their fellow users’ behaviour. In the commons analysed, specific monitoring positions were foreseen in the regulations with a division of tasks between those officials in charge of enforcing the rules and imposing fines, and those responsible for executing them. Members were usually appointed for one year and they were obliged to accept the appointment under the threat of a penalty for refusal. In order to compensate for undertaking a rather unpopular job, monitors were not only frequently remunerated but they were also entitled to a share of any fines imposed. Surveillance and detection of infringements could also build upon more informal mechanisms – the mutual control inevitably deployed by commoners in the performance of their daily activities, as well as the supplementary monitoring often foreseen in the regulations. In this respect, the effectiveness of the regulations largely relied on the activities of commoners themselves. Their intervention was not only explicitly foreseen when officials were negligent in the fulfillment of their duties but also explicitly encouraged as an additional monitoring mechanism – with a share of the penalties levied being used as incentive. The commoners’ responsibilities even reached the point of being subjected to punishment when they did not report offences they had observed. Actually, these ‘liability clauses’ are common in all the regulations analysed. Punishment was actually the last method to which users resorted in order to control the resource’s exploitation levels. Several interesting insights are worth mentioning at this respect. First, the specification of the fine levels probably responded more to trial-and-error processes than to once-for-all designs – with the subsequent adjustment of fine levels reflecting changing circumstances. Second, graduated sanctioning seems to have had a very limited role in disciplining commoners’ behaviour: <2% of the 1134 individual rules analyzed contain graduated sanctions (see also Table 3). This demonstrates probably that the use of graduated sanctions was really a last resort for commoners to enforce the rules, in particular vis-à-vis recidivists. It suggests that the presence of graduated sanctions may, instead of being a sign of resilience and robustness, rather be an indicator of the weaknesses of other mechanisms to prevent freeriding. Percentage of Individual Rules without Sanction and Longevity in Dutch Commons. Note: For more details and additional tables, see De Moor and Tukker 2015. Third, differentiation of the fine levels according to membership was however much more decisive in determining the level of the penalty. Offences committed by officials were subjected to a harsher treatment than when the infractor was a simple commoner – a differentiation explained by the more fundamental role that officials had in guaranteeing the sustainability of the commons as a governance regime. Similarly, the lower probability of being caught when committing an offence at night (e.g. digging peat beyond the authorized limits) explains the need to raise fine levels in order to discourage potential offenders. In any case, the punishment of those breaking the rules did not come without problems. Several regulations show how officials in charge of fine collection often overlooked other commoners’ fines. When fines were actually imposed, problems in paying them are also frequently documented – which often led to constant re-arrangements and in some cases to final bankruptcy. Longevity, sanctioning and participation. Widening the geographical scope of the analysis up to eight Dutch commons, De Moor and Tukker (2015) have suggested a number of interesting hypotheses about the relationship between the longevity of institutions for collective action the level of sanctioning, and the degree of commoners’ involvement in the drafting of new regulations. The main hypothesis put forward by the authors is that the longevity of commons exhibits a negative relationship with the amount of effort devoted by commoners to design and enforce sanctions, but a positive one with the degree of involvement. Long-standing commons would not be characterized by a highly repressive apparatus able to completely deter or punish free-riding, but by a participatory regime in which commoners came together relatively often to adjust rules to changing circumstances. Information exchange, mutual monitoring, and internalization of norms are probably more effective in explaining success than plain sanctioning. The analysis of the rules of Dutch commons indeed demonstrates that the longer living commons were the ones that had the least number of rules that included also a sanction. Commons that were shorter lived had spent far more effort in designing sanctions to go with the rules. This analysis points to a number of features that seem to have systematically characterized the institutional design of Dutch marken. First of all, when observing the years for which commons’ regulations are available, it becomes clear that long-enduring commons usually changed their regulations more incrementally: their commoners used to meet more frequently to make just a few number of adjustments. By contrast, few but more substantial changes are observed in more short-lived commons. Second, around half of rules across all the commons analysed dealt with issues of use with smaller proportions being concerned with governance and management aspects. Third, most rules did not have any sanction attached to them – with an even higher share of rules without explicit sanctioning among those commons which managed to survive over a longer period. Fourth, around half of the changes in the regulations analyzed consisted of adjustments of previously formulated rules – probably an indication that commoners were constantly taking into account in the regulation of the collective resources the internal and external circumstances. Simple rule repetition was, by contrast, much less important. However, the longer a common survived, the smaller the significance of rule repetition in the whole process of rule change seems to have been – which again is suggestive of the importance that members’ involvement and rule internalization could have had in more successful commons. Taking them together, all these insights allow de Moor and Tukker to put forward their hypothesis regarding sanctioning, member involvement in rule-making, and longevity of the commons – a preliminary statement that, given the small number of commons analysed and the limitations associated with historical records, remains to be further validated by subsequent research. Emergence and change of commons as governance regime. Focusing on the Spanish regulations, Laborda et al. (2016) study how institutional change took place in the commons over the long run. In their paper, institutional change not only encompass the frequent adjustment of the regulations once these were already in place but also the initial formalization of the commons themselves. These authors analyse a number of communities located in northern Spain where collective exploitation of resources was already documented in late medieval times. Despite important differences in their geographical and climatic conditions, from the beginning of their existence as human settlements these communities were forced to develop some kind of coordination both among their members and among themselves. The mixed farming system that, with varying degrees of intensity, was at the basis of their livelihood was associated with a number of problems (cattle trespassing into cultivated fields, overgrazing of common grasslands) whose mitigation necessarily involved cooperation between neighbours and communities. As the authors document, the formalization of these communal arrangements coincided with the phase of demographic expansion experienced by the region during pre-Black Death times (13th and early 14th centuries). The informal customs that governed resource exploitation until then probably started to reveal themselves inadequate to deal with increasing pressure on grasslands and water reservoirs. References to conflicts and violence are common in the sources from these centuries. In face of this situation, historical evidence points to a process of bottom-up institutional building through which neighbours and communities reached a number of compromises aimed at alleviating conflict and providing order in the exploitation of resources. The relative weakness that lordships exhibited in the region as well as the small size of the communities involved must have helped in the development of these self-governed arrangements. But particularly important in preserving self-governance was the role played by the Crown itself. On the one hand, the location of these communities close to a political frontier during most pre-industrial times probably gave them a strong bargaining position vis-à-vis the king. Similarly, the budget restrictions often faced by the royal treasury contributed to the delegation of jurisdictional powers to lower levels. On the other, the royal interest in maintaining a prosperous and stable frontier prevented conflicts between communities from escalating and threatening the survival of the arrangements. At this respect, the role played by the royal courts as guarantors of the stability and permanence of the collective arrangements was particularly relevant – supplementing the conflict-settlement mechanisms found at the level of the communities themselves. The clear delimitation of boundary rules (i.e. the demarcation of the resources and the definition of membership), as reflected in the foundational documents of these arrangements, gave way to other concerns with the passage of time. In this sense, the adjustment of rules exhibits important similarities across communities. Although minor changes in membership criteria and the boundaries of the common resources are still visible once the formal governance arrangements had been established, commoners were largely concerned with the direct regulation of the exploitative activities. Rules governing use never represented less than half of the recorded rule changes. A great deal of commoners’ efforts focused on the adjustment of the rules on stinting, quotas, or cattle entry to and exit from the common resource, to varying circumstances. Operational concerns, however, never exhausted the regulatory concerns of the communities. Attention to the collective-choice arrangements through which operational rules were discussed, to the monitoring mechanisms behind rule compliance, and to conflict-settlement bodies are widespread. Two specific issues constantly reappear in the sources – both of them clearly pointing at the significance that communities attached to active member involvement in political and managerial affairs. One is the regulation of attendance and conduct at the community meetings; the other, the appointment of officials and the rotating nature of these positions. That a tension existed between neighbours’ indifference and the interest of the community as a whole surfaces in the establishment of penalties in case of non-attendance to a meeting or non-acceptance of an appointment. Attention to the emergence and change in commons in the long run unavoidably calls for historians and their tools to join other social scientists in their analysis of resilient collective action. Characterized by their stress on developments over the very long run, the analysis of primary sources, and their attention to the overall context in which individuals interact, we think that historians are well equipped to expand our knowledge on how institutions for collective action emerge and evolve throughout time. Rather than confinement within the boundaries of our respective disciplines, interaction between us is necessary if we want to fully understand these processes. Building upon theories from the social sciences but also from biology or physics, commons’ scholars have sketched over the last decades a novel analytical framework – with the Institutional Analysis and Development Framework probably being the most salient example of this. In their recent quest for reassessing commons and other institutions for collective action in pre-industrial Europe, historians have gathered a great deal of primary evidence on the long-term evolution of these arrangements. By bringing these theories, methods and evidence together, our intention is to suggest new directions for research on the long-term evolution of commons with the expectation that other scholars will follow. Rather than a self-contained showcase of finished work, this paper represents an invitation to other scholars interested in commons to join our efforts – an invitation particularly aimed at our fellow historians. As this paper argues, historical regulations are a very valuable source of information to unveil the evolution of commons over time – a still under-explored area within the commons discipline. By developing and implementing our novel methodology, our conviction is that one more step has been taken in that direction. We are thrilled to welcome other colleagues in this endeavor. 2The database of our project is publicly available at: www.collective-action.info/commons/login.php (previous request to the authors of the view-mode password). 3Such a rule-based definition of institution contrasts markedly with the equilibrium view posited by authors such as Masahiko Aoiki (2001) or Avner Greif (2006) – for whom ‘institutions’ are the equilibrium behaviour that derives from a specific game structure (of which rules are in turn only one sub-component). Instead of only focusing on rules. Greif therefore defines ‘institutions’ as ‘a system of social factors that conjointly generate a regularity of behaviour’ (in Greif 2006, 30). 4For the Dutch and English cases, these ‘hidden’ rules were identified and extracted from the minutes to be subsequently incorporated in our dataset. In the case of the Spanish commons, it has not been possible to retrieve such information– which might partly explain the referred contrast between the Dutch and the Spanish rules regarding the number and frequency of rule changes. 5The regulations of the different communities included in the dataset were originally collected by René van Weeren and Tine de Moor (for the Dutch case studies), Angus Winchester (for the English ones) and José Miguel Lana-Berasain (for the Spanish ones) – either directly from the archives or from already published compilations. For details on the sources, see the references to the primary sources indicated in the reference list. 6René van Weeren and Annelies Tukker entered the Dutch regulations, Angus Winchester the English ones, and José Miguel Lana-Berasain, Vicente Cendrero-Almodovar, and Miguel Laborda-Pemán the Spanish ones. 7Attention to these individual clauses within each chapter (or ‘individual rules’ in our own terminology) follows closely the concept of ‘institutional statement’ as defined by Ostrom and Crawford in Ostrom (2005). These institutional statements are defined as ‘a broad set of shared linguistic constraints and opportunities that prescribe, permit, or advise actions or outcomes for participants in an action situation’ (Ostrom 2005, 137–138). This concept puts special emphasis in the shared and known nature of these statements among all the participants in an action situation. We would like to thank Annelies Tukker and Vicente Cendrero-Almodóvar for their help with the codification of the commons’ regulations, as well as the participants in the Common People, Common Rules Workshop held in Pamplona, Spain, in October 2014, and an anonymous reviewer for their comments on an earlier draft. The Common Rules Project was funded by the Dutch NWO (project number: 236-50-005). Alston Moor, Cumberland. ‘Paine roll’ c.1500 (copied 1597), printed in A. J. L. Winchester, The Harvest of the Hills: rural life in northern England and the Scottish borders, 1400–1700 (Edinburgh, 2000), pp. 162–165. Braithwaite and Coledale, Cumberland. Manor court verdicts, 1671–1828: Whitehaven, Cumbria Archive Centre, DLEC, box 120. Eskdale, Cumberland. Grazing order (‘Eskdale Twenty-four Book’) 1587 (18th-century copy) and manor court verdicts 1678–1841: Whitehaven, Cumbria Archive Centre, DBEN 3/761 and DLEC, box 94. Hutton-in-the-Forest, Cumberland. Pain list 1637, amended to 1668: Carlisle, Cumbria Archive Centre, DVAN 1/4/2/2. Millom, Cumberland. Orders extracted from manor court records, 1511–1669: Carlisle, Cumbria Archive Centre, DLONS W8/12/1-22. Nether Wasdale, Cumberland. Pain list, 1679, and manor court verdicts 1678–1857: Whitehaven, Cumbria Archive Centre, DLEC, box 94. Thornthwaite, Westmorland. Pain book, 1612–1778: Manchester, John Rylands Library, English MS 1155. Watermillock, Cumberland. Pain book, 1615–1706, printed in W. Hodgson, ‘A century of “paines” …’, Transactions of Cumberland & Westmorland Antiquarian & Archaeological Society, old series, 7 (1883), pp. 27–47. Berkum. Historisch Centrum Overijssel, Stadsarchief van Zwolle 1230–1813, deel III, index 700C: Inv. nr. 12599, Markeboek met willekeuren van Berkum 1300–1611; Inv. nr. 12603, Resoluties van de markegenoten van Berkum 1722–1777. Historisch Centrum Overijssel, Archief van de marken in de provincie Overijssel, index 0157: Inv. nr. 148, Markeboek Berkum, 1300–1656; Inv. nr. 149, Markeboek Berkum, 1819–1865. Besthmen. Historisch Centrum Overijssel, Archief van de marken in de provincie Overijssel, index 0157: Inv. nr. 157, Markeboek Besthmen, 1458–1748; Inv. nr. 158, M arkeboek Besthmen, 1841–1852; Inv. nr. 159, Markeboek Besthmen, 1458–1840. Coevorden. Drents Archief, Archief van stad en heerlijkheid Coevorden, toegang 0116: Inv. nrs. 1047–1057. Dunsborger Hattemer. Transcribed regulations in Menkveld, A. and Renema, J. 1996. Markeboek van de Dunsborger Hattemer Marke 1810–1847. S.l. : Oostgelders Tijdschrift voor Genealogie en Boerderij-onderzoek, and Menkveld, A. and Renema, J. 1996. Markeboek van de Dunsborger Hattemer Marke 1553-1810-1847. S.l. 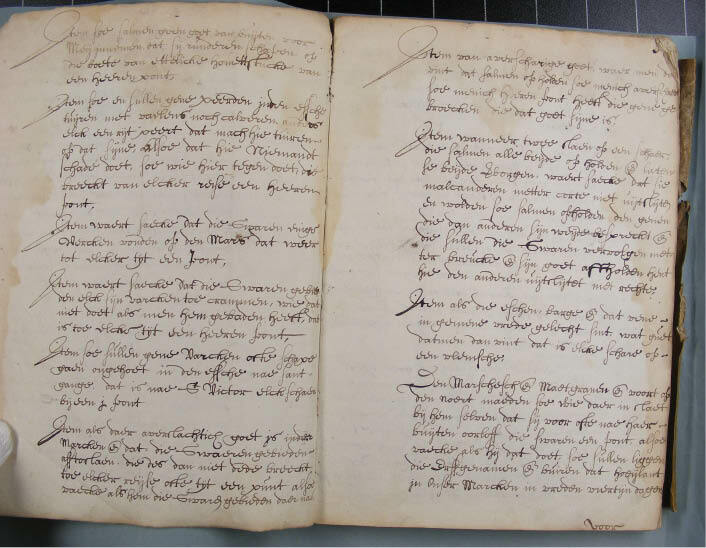 : Oostgelders Tijdschrift voor Genealogie en Boerderij-onderzoek. Exel. Transcribed regulations in Beuzel, G. J. 1988. Markeboek van de marke Exel 1616–1937. S.l. : Oostgelders Tijdschrift voor Genealogie en Boerderij-onderzoek. Geesteren-Mander en Vasse. Historisch Centrum Overijssel, Archief van de marken in de provincie Overijssel, index 0157: Inv. nr. 350, Markeboek Geesteren, Mander en Vasse, 1498–1647; Inv. nr. 353, Markeboek Geesteren, Mander en Vasse, 1649–1772. Rozengaarde. Historisch Centrum Overijssel, Archief van de marken in de provincie Overijssel, index 0157: Inv. nr. 1109, Markeboek Rozengaarde 1417–1509; Inv. nr. 1110, Markeboek Rozengaarde 1417–1572; Inv. nr. 1111, Markeboek Rozengaarde 1480–1572; Inv. nr. 1112, Markeboek Rozengaarde 1608–1704; Inv. nr. 1113, Markeboek Rozengaarde 1693–1766; Inv. nr. 1114, Markeboek Rozengaarde 1767–1808; Inv. nr. 1115, Markeboek Rozengaarde 1809–1866. Bardenas Reales. 1498 document printed in F.Idoate. 1997. La Comunidad del Valle de Roncal. Diputación Foral de Navarra: Pamplona. 1756 Ordenanzas printed in J.J. Montoro Sagasti. 1926. Recopilación de las ordenanzas de las Bardenas de Navarra desde las primeras de 1756 hasta las de 1915. Tudela: Imprenta de Castilla. Sierra de Lokiz. 1357 (Archivo Real y General de Navarra –ARGN-, Tribunales Reales, Procesos –TTRR/P-, nº 130830), 1788, 1824 (Archivo de la Junta de la Sierra de Lokiz, Zudaire, Navarra, box 17/4, box 23/9). Valle de Roncal. Ordenanzas printed in F.Idoate. 1997. La Comunidad del Valle de Roncal. Diputación Foral de Navarra: Pamplona, pp. 171–434. J.C. Alli Aranguren. 1989. La Mancomunidad del Valle de Roncal. Pamplona: Gobierno de Navarra, pp. 311–418. Acemoglu, D, Johnson, S and Robinson, J (2005). Aghion, P. and Durlauf, S. N. eds. Institutions as the Fundamental Cause of Long-Run Growth. Handbook of Economic Growth. Vol. 1aNorth-Holland: Amsterdam. Agrawal, A and Chhatre, A (2006). Explaining Success on the Commons: Community Forest Governance in the Indian Himalaya. World Development 34(1): 149–166. http://dx.doi.org/10.1016/j.worlddev.2005.07.013. Allen, R. C (1982). The Efficiency and Distributional Consequences of Eighteenth Century Enclosures. The Economic Journal 92: 937–953. http://dx.doi.org/10.2307/2232676. Alston, L. J, Eggertson, T and North, D. C. (1996). Empirical Studies in Institutional Change. Cambridge, UK: Cambridge University Press. Aoiki, M (2001). Towards a Comparative Institutional Analysis. Boston MA: The MIT Press. Axelrod, R (1984). The Evolution of Cooperation. New York: Basic Books. Beekman, A. A (1938). Geschiedkundige Atlas Van Nederland. ‘s-Gravenhage: M. Nijhoff. Caro Baroja, J (1995 ). Los Vascos. Madrid: Akal. Casari, M (2007). Emergence of Endogenous Legal Institutions: Property Rights and Community Governance in the Italian Alps. The Journal of Economic History 67(1): 191–226. http://dx.doi.org/10.1017/S0022050707000071. Conley, A and Moote, M (2003). Evaluating Collaborative Natural Resource Management. Society and Natural Resources 16: 371–386. http://dx.doi.org/10.1080/08941920309181. Cox, M, Arnold, G and Villamayor-Tomás, S (2010). A Review and Reassesment of Design Principles for Community-Based Natural Resource Management. Ecology and Society 15(4): 38. Dawes, R. M (1980). Social Dilemas. Annual Review of Psychology 31(1): 169–193. http://dx.doi.org/10.1146/annurev.ps.31.020180.001125. De Moor, T (2008). The Silent Revolution: A New Perspective on the Emergence of Commons, Guilds, and Other Forms of Corporate Collective Action in Western Europe. International Review of Social History 53(Supplement S16): 179–212. http://dx.doi.org/10.1017/S0020859008003660. De Moor, T (2009). Avoiding Tragedies: A Flemish Common and Its Commoners Under the Pressure of Social and Economic Change During the Eighteenth Century. Economic History Review 62(1): 1–22. http://dx.doi.org/10.1111/j.1468-0289.2008.00426.x. De Moor, T (2015). The Dilema of the Commoners. Understanding the Use of Common-Pool Resources in Long-Term Perspective. Cambridge, UK: Cambridge University Press.. http://dx.doi.org/10.1017/CBO9781139135450. De Moor, T and Tukker, A (2015). Participation versus Punishment. The Relationship Between Institutional Longevity and Sanctioning in the Early Modern Times In: Grüne, N, Hübner, J and Siegl, G. eds. Ländliche Gemeingüter. Kollektive Ressourcennutzung in Der Europäischen Agrarwirtschaft/Rural Commons: Collective Use of Resources in the European Agrarian Economy 12 Jahrbuch Für Geschichte Des Ländlichen Raumes. De Moor, M, Shaw-Taylor, L and Warde, P (2002). Preliminary Conclusions: The Commons of Northwestern Europe In: de Moor, M, Shaw-Taylor, L. and Warde, P. eds. The Management of Common Land in North West Europe, C, 1500–1850. Turnhout: Brepols. Ensminger, J (1996). Making a Market. The Institutional Transformation of an African Society. Cambridge, UK: Cambridge University Press. Epstein, S. R (1998). Craft Guilds, Apprenticeship, and Technological Change in Pre-Industrial Europe. Journal of Economic History 58(3): 684–713. http://dx.doi.org/10.1017/S0022050700021124. Floristán Imizcoz, A (1982). La Merindad De Estella En La Edad Moderna: Los Hombres Y La Tierra. Institución Príncipe de Viana: Pamplona. Gordon, H. S (1954). The Economic Theory of a Common-Property Resource: The Fishery. Journal of Political Economy 62(2): 124–142. http://dx.doi.org/10.1086/257497. Grantham, G. W (1980). The Persistence of Open-Field Farming in Nineteenth Century France. Journal of Economic History 40(3): 515–531. http://dx.doi.org/10.1017/S0022050700085211. Greif, A (2006). Institutions and the Path to the Modern Economy. Cambridge, UK: Cambridge University Press.. http://dx.doi.org/10.1017/CBO9780511791307. Grüne, N, Hübner, J and Siegl, eds, G (2015). Ländliche Gemeingüter. Kollektive Ressourcennutzung in der europäischen Agrarwirtschaft/Rural Commons: Collective Use of Resources in the European Agrarian Economy. 12Jahrbuch für Geschichte des ländlichen Raumes. Hajjar, R, Oldekop, J, Cronkleton, P, Etue, E, Newton, P, Russel, A, Tjajadi, J, Zhou, W. and Agrawal, A. (2016). The Data Not Collected on Community Forestry. Conservation Biology, forthcoming. Haller, T (2010). Disputing the Floodplains: Institutional Change and the Politics of Resource Management in African Wetlands. Leiden: Brill.. http://dx.doi.org/10.1163/ej.9789004185326.i-454. Hardin, G (1968). The Tragedy of the Commons. Science 162(3859): 1243–1248. http://dx.doi.org/10.1126/science.162.3859.1243. Henrich, J, Boyd, R, Bowles, S, Camerer, C, Fehr, E and Gintis, H eds. (2004). Foundations of Human Sociability: Economic Experiments and Etnographic Evidence from Fifteen Small-Scale Societies. Oxford: Oxford University Press. Hodgson, G (2006). What are Institutions?. Journal of Economic Issues 40(1): 1–25. http://dx.doi.org/10.1080/00213624.2006.11506879. Idoate, F (1977). La Comunidad del Valle de Roncal. Pamplona: Diputación Foral de Navarra. Janssen, M, Bousquet, F and Ostrom, E (2011). Multi-Method Approach to Study the Governance of Social-Ecological Systems. Natures Sciencie Societé 19(4): 382–394. http://dx.doi.org/10.1051/nss/2011135. Janssen, M, Lindahl, T and Murphy, J (2015). Advancing the Understanding of Behavior in Social-Ecological Systems: Results from Lab and Field Experiments. Ecology and Society 20(4): 34. http://dx.doi.org/10.5751/ES-08097-200434. Kahneman, D (2011). Thinking, Fast and Slow. New York: Farrar, Strauss and Giroux. Kingston, C and Caballero, G (2009). Comparing Theories of Institutional Change. Journal of Institutional Economics 5(2): 251–180. http://dx.doi.org/10.1017/S1744137409001283. Kollock, P (1998). Social Dilemmas: The Anatomy of Cooperation. Annual Review of Sociology 24: 183–214. http://dx.doi.org/10.1146/annurev.soc.24.1.183. Laborda-Pemán, M and De Moor, T (2013). A Tale of Two Commons: Some Preliminary Hypotheses on the Long-Term Development of the Commons in Western and Eastern Europe, 11th–19th centuries. International Journal of the Commons 7(1): 7–33. http://dx.doi.org/10.18352/ijc.355. Laborda-Pemán, M, Lana-Berasain, J. M and Cendrero-Almodóvar, V (2016). Changing the Commons. Understanding Institutional Change in Seven Pre-Industrial Communities, Northern Spain, 14th–19th Centuries, Unpublished paper. Lana, J. M (2008). From Equilibrium to Equity. The Survival of the Commons in the Ebro Basin: Navarra from the 15th to the 20th centuries. International Journal of the Commons 2(2): 162–191. http://dx.doi.org/10.18352/ijc.49. Larrea, J.-J (2005). Maroto, J, Ramió, S and Ripoll, E. eds. Comunidades, Puertos e Infanzonías. Estado De La Cuestión Y Algunos Interrogantes Sobre El Devenir Social Y Económico Del Pirineo Navarro-Aragonés De La Edad Media. Medievalis Historia Pyrenaica. Girona: UNED, pp. 47–78. McCloskey, D (1972). The Enclosure of Open Fields: Preface to a Study of Its Impact on the Efficiency of English Agriculture in the Eighteenth Century. Journal of Economic History 32(1): 15–35. http://dx.doi.org/10.1017/S0022050700075379. North, D. C (1990). Institutions, Institutional Change and Economic Performance. Cambridge: Cambridge University Press.. http://dx.doi.org/10.1017/CBO9780511808678. North, D. C and Thomas, R. P (1973). The Rise of the Western World: A New Economic History. Cambridge, UK: Cambridge University Press. Nowak, M. A and Highfield, R (2011). Super Cooperators. Altruism, Evolution, and Why We Need Each Other to Succeed. New York: Free Press. Ogilvie, S (2007). ‘Whatever is, is Right’? Economic institutions in pre-industrial Europe. Economic History Review 60(4): 649–684. Ogilvie, S and Carus, A. W (2014). Institutions and Economic Growth in Historical Perspective In: Aghion, P and Durlauf, S. N. eds. Handbook of Economic Growth. Vol. 2ANorth-Holland: Amsterdam. http://dx.doi.org/10.1111/j.1468-0289.2007.00408.x. Olson, M (1965). The Logic of Collective Action. Public Goods and the Theory of Groups. Harvard University Press: Cambridge, MA. Ostrom, E (2014). Do Institutions for Collective Action Evolve?. Journal of Bioeconomics 16(1): 3–30. http://dx.doi.org/10.1007/s10818-013-9154-8. Ostrom, E (2005). Understanding Institutional Diversity. Princenton University Press: Princeton. Ostrom, E (1992). The Rudiments of a Theory of the Origins, Survival, and Performance of Common-Property Institutions In: Bromley, D. W. The Rudiments of a Theory of the Origins, Survival, and Performance of Common-Property Institutions In: Making the Commons Work: Theory, Practice and Policy. ICS Press: San Francisco. Ostrom, E (1990). Governing the Commons. The Evolution of Institutions for Collective Action. Cambridge University Press: Cambridge, UK.. http://dx.doi.org/10.1017/CBO9780511807763. Pagdee, A, Kim, Y.-S. and Daugherty, P. J. (2006). What Makes Community Forest Management Succesful: A Meta-Study From Community Forests Throughout the World. Society and Natural Resources 19: 33–52. http://dx.doi.org/10.1080/08941920500323260. Poteete, A. R, Janssen, M and Ostrom, E (2010). Working Together: Collective Action, the Commons, and Multiple Methods in Practice. Princeton: Princeton University Press. http://dx.doi.org/10.1515/9781400835157. Putnam, R (1993). Making Democracy Work: Civic Traditions in Modern Italy. Princeton: Princeton University Press. Rodgers, C. P, Straughton, E. A, Winchester, A. J. L and Pieraccini, M (2011). Contested Common Land. Environmental Governance Past and Present. London: Earthscan. Runge, C. F (1992). Common Property and Collective Action in Economic Development. World Development 14(5): 623–635. http://dx.doi.org/10.1016/0305-750X(86)90128-2. Simon, Herbert . (1983). Reason in Human Affairs. Stanford CA: Stanford University Press. Stasavage, D (2014). Was Weber Right? The Role of Urban Autonomy in Europe’s Rise. American Political Science Review 108(2): 337–354. http://dx.doi.org/10.1017/S0003055414000173. Tagliapietra, C (2011). Charters, Partnerships and Natural Resources: Two Cases of Endogenous Regulation in Italy. Economic Affairs 31(2): 30–35. http://dx.doi.org/10.1111/j.1468-0270.2011.02098.x. Thirsk, J (1964). The Common Fields. Past & Present 29(1): 3–25. http://dx.doi.org/10.1093/past/29.1.3. Van Weeren, R and De Moor, T (2014). Controlling the Commoners: Methods to Prevent, Detect, and Punish Free-Riding on Dutch Commons in the Early Modern Period. Agricultural History Review 62(2): 256–277. Van Zanden, J. L (2009). The Long Road to the Industrial Revolution: The European Economy in a Global Perspective, 1000–1800. Leiden: Brill. Van Zanden, J. L and Prak, M (2006). Towards an Economic Interpretation of Citizenship: The Dutch Republic Between Medieval Communes and Modern Nation-States. European Review of Economic History 10(2): 111–145. http://dx.doi.org/10.1017/S1361491606001651. Winchester, A (2015). ‘By Ancient Right or Custom’: The Local History of Common Land in a European Context. The Local Historian 45: 266–285. This is the Contributor version of the codebook, containing all the required descriptions of fields used by, or useful for contributors of new data to the original database. Next to this version, versions 5.0 (Full version) and 5.2 (View-only version) have been created, respectively for the database developers and guests who only want to look at the database without contributing data. The database CommonsDB is a result of the research activities related to the projects ‘Data Infrastructures for the Study of Guilds and Other Forms of Collective Action’ (completed ultimo 2011) the ERC-funded project ‘“United We Stand”. The Dynamics and Consequences of Institutions for Collective Action in Pre-Industrial Europe’’, and the NWO-funded project ‘Common Rules’. general data on the commons (name, location, population, natural environment, et cetera). These data are being gathered from a wide range of sources, such as compendiums, atlases, archival documents, et cetera. data on the regulation of these commons. These data come from either original archival sources (such as the markeboeken for the Dutch commons) or from transcribed sources (either in hard copy or in digital form). The general data on the commons – entered in the Main Table Commons – had already been transferred integrally from the original dataset. These data have been collected and entered previously. After these initial preparatory steps, the first steps of the analysis process begin. in case the Original Rule contains various separate rules, copy the text (in case the form has not copied it for you) of the Original Rule to the Individual Rule (Note: in case the Original Rule contains only one single rule, the Individual Rule will be equal to the Original Rule (one-on-one-relationship); in the other cases, the Original Rule and the Individual Rules have a one-to-many-relationship). in the next step, the Individual Rule will be ‘dissected’, coding the various individual elements of the rule (resource concerned, nature of the rule, et cetera). each Individual Rule may contain either a) no sanctions, b) one sanction, or c) several sanctions for breaking the Individual Rule concerned; subsequently, the relationship between Individual Rule and Sanctioning General therefore is a) null, b) one-to-one, c) one-to-many). The sanctioning and their characteristics (nature, amount of fine, status of offenders, et cetera) are being registered in three separate tables. One General Sanction may contain a) one specific type of sanctioning, or b) several specific types of sanctioning. Therefore, the relationship between Sanctioning General and Sanctioning Specific is a) one-to-one, b) one-to-many. The specific types of sanctioning may contain either a) no subdivision, b) one subdivision, or c) several subdivisions. Therefore, the relationship between Sanctioning Specific and Subdivision is a) null, b) one-to-one, c) one-to-many). Based upon the structure of the data found so far, the database has been designed by creating 6 main tables and numerous subtables. The database has been designed in a way that the main tables contain unique information per record, whereas the subtables are being used as reference lists (drop-down-lists) for the main tables; the subtables also are being used to code the entered data simultaneously at entry. For schematic overview see Appendix A. Main tables: Main Table, followed by the item the table deals with (Commons, Original Rules, Individual Rules, Sanctioning (general), Sanctioning (specific), and Subdivision). 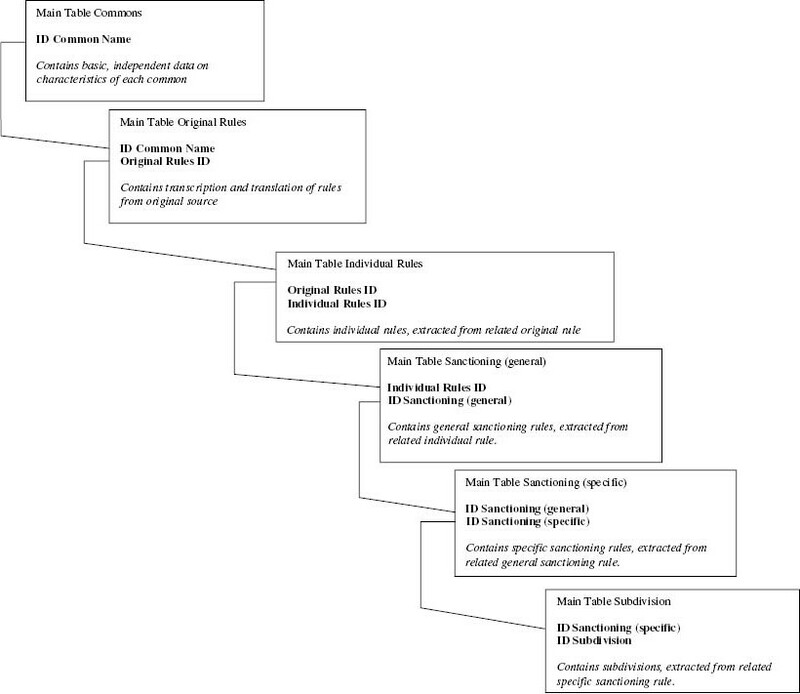 Subtables: Subt, followed by a space, followed by the character(s) defining the related main table (C=Commons, Ir=IndividualRules, Sc=Sanctioning), followed by an underscore and a description of the item the subtable contains. For an overview of the current tables, see Appendix B. Other: is to be used when no suitable value is available. Unspecified: is to be used when no (further) specification is given. Access Regulations specifying who was entitled to use the marke, either implicitly or explicitly excluding all other persons. Regulations specifying the conditions for being admitted as entitled user. Regulations forcing those not entitled to correct their unjustified use (e.g., the obligation to remove their animals from the lands of the marke). Regulations prohibiting the use of resources by non-members who are using ‘strawmen’. Regulations prescribing former members to leave the marke or the common land. Regulations prohibiting non-members to gain any profit from resources of the marke (e.e., the prohibition to export any resource or to sale these resources outside of the marke). Use Regulations prohibiting specific use or action to all, regardless whether being a member or not. Regulations providing specifications on the way to use resources to those being entitled to use these resources. Regulations prescribing obligations concerning physical action (e.g., maintenance of drainage system, maintaining fields properly, coevring up lands). Regulations granting permission to specified members. Management Regulations granting general management permissions to the benefit of the members as a whole (e.g., the permission to sell land to the benefit of the marke). Regulations specifying obligations concerning non-physical action (e.g., being present at meeting, notifying superiors). Regulations regarding financial obligations for members. Regulations based on ‘higher’ regulations, sometimes originating from ancient times (e.g., exemption from taxes for ‘havezaten’). Regulations about procedures of meetings. Governance structure Regulations with a direct link to the management structure of the marke (e.g., the frequency of meetings, the way regulations were notified to the public). Regulations determining who should execute sanctions and/or in which way. Regulations regarding appointment of officials. Regulations specifying the tasks of officials within the marke. Regulations regarding the authorization of officials to act on behalf of the marke. Permission* Regulations granting permission to use (resources of) the common in general or to specific (group of) members. Regulations granting permission to specific members (e.g., to stay at their farm on the common). Regulations granting access and/or use to persons. * If the rule is linguistically constructed as a permission, but has a sanctioning rule attached to it, then it is an obligation or a prohibition, and should be coded accordingly. * If the permission is dependent on specific conditions (but without a sanctioning rules) these conditions are to be entered into Rule Primary Condition,Rule Secondary Condition, and Rule Tertiary Condition. Obligation Regulations concerning the obligation of members regarding use of the common. Regulations concerning the obligations required for gaining access or obtaining membership. Regulations regarding the required tasks of officials. Regulations regarding required actions from either specified or unspecified persons. Prohibition Regulations forbidding access or use to either specified or unspecified persons. Regulations prohibiting certain actions for a specific period and/or a specific location (e.g., prohibition to graze animals on the common during part of the season; in case this has been mentioned as: it is permitted to graze for a certain period, enter the option as permission!). Regulations defining actions not to be allowed to specified or unspecified persons. Appointment Regulations regarding merely the appointment of officials; regulations regarding their tasks should be entered either as obligation or prohibition, depending on the content and nature of the regulation. Rejection Only to be used in case propositions that had been made, were rejected by the decision makers. General All regulations that could not be categorized within the categories mentioned above. Adjustment Regulations regarding changes to an earlier rule. Annulation Regulations that were set at a certain time that are cancelled. First mentioning First regulation about a specific topic. If there is already a rule about this topic, the rule is an adjustment. (Clarification: the first rule about keeping cows on the common is a first mentioning, subsequent rules that may be for different users, bulls, specific locations etc. are considered as adjustment. Repetition Regulations that are repeated at a later date than the original regulation, without any adjustments. Singular mentioning Regulations that are only mentioned a single time within the set of regulations for a common. Borders Regulations about the borders of the common. Housing Regulations about housing on the common. Infrastructure Regulations on infrastructure on the common. Topsoil Resources Regulations on topsoil resources. Subsoil Resources Regulations on subsoil resources. Water Regulations regarding use of water. Animals - Bees Regulations on keeping bee(hives) on the common. Animals - Cows Regulations regarding cattle (including cows, calves and bulls). Animals - Fish Regulations on fishing. Animals - Geese Regulations regarding geese (including ganders and goslings). Animals - Goats Regulations concerning goats (including billy goats). Animals - Horses Regulations on horses (including mares, stallions and foals). Animals - Mules Regulations on mules. Animals - Oxen Regulations concerning oxen. Animals - Pigs Regulations on pigs (including sows, piglets and boars). Animals - Sheep Regulations on sheep (including lambs and rams). Borders - Conflicts Regulations on border conflicts. Borders - Fences Regulations on (setting and maintaining) fences. Borders - Right of Way Regulations specifying the right of way. Borders - Setting of Borders Regulations on setting borders (for instance setting border markers, or specifying the exact borders of the common in the regulations). Housing - Cabins Regulations on cabins and cottages (on the common). Housing - General General Regulations on housing. Housing - Manors Regulations on manors. Housing - Manorial Farms Regulations on manorial farms. Housing - Peasant Farms Regulations on peasant farms. Infrastructure - Bridges Regulations on (maintaining) bridges. Infrastructure - Culverts and Sluices (Drainage) Regulations on (maintaining) culverts and sluices. Infrastructure - Ditches (Drainage) Regulations on (maintaining) ditches. Infrastructure - Dykes Regulations on (maintaining) dykes. Infrastructure - General General regulations on infrastructure. Infrastructure - Leat (Drainage) Regulations on (maintaining) the leat. Infrastructure - Roads Regulations on (maintaining) roads. Infrastructure - Waterways (Drainage) General Regulations on (maintaining) waterways. Subsoil - Clay Regulations on (collecting) clay. Subsoil - Dredgings Regulations on (collecting) dredgings. Subsoil - Fossile Trees Regulations on (digging up) fossile trees. Subsoil - Loam Regulations on (collecting) loam. Subsoil - Peat Regulations on (collecting) peat. Topsoil - Diggings general Regulations on general diggings. Topsoil - (Drifting) Sand Regulations on (collecting) sand and (fighting) drifting sands. Topsoil - Land General regulations on common land. Topsoil - Manure Regulations on (collecting) manure. Topsoil - Toppeat (schelturf) Regulations on (collecting) toppeat. Topsoil - Sods Regulations on (collecting) sods. Topsoil - Stones Regulations on (collecting) stones. Vegetation - Acorns Regulations on (collecting) acorns. Vegetation - Bracken Regulations on (collecting) bracken. Vegetation - Bushes Regulations on (cutting) bushes. Vegetation - Crops (in general) Regulations on crops in general. Vegetation - Forests Regulations on forests. Vegetation - Gorse Regulations on (collecting) gorse. Vegetation - Grass Regulations on (collecting) grass. Vegetation - Hay Regulations on (collecting) hay. Vegetation - Heath Regulations on (collecting) heath. Vegetation - Moss Regulations on (collecting) moss. Vegetation - Reeds Regulations on (collecting) reeds. Vegetation - Rushes Regulations on (collecting) rushes. Vegetation - Sedges Regulations on (collecting) sedges. Vegetation - Stalks Regulations on (collecting) stalks. Vegetation - Thistle Regulations on (collecting) thistle. Vegetation - Timber Regulations on (collecting) timber. Vegetation - Wood Regulations on (collecting) wood. Water - Drinking Regulations on letting animals drink. Water - Irrigation Regulations on irrigation of soil. Administration Regulations regarding the administration of the common. Finance Regulations regarding financial matter. Maintenance in general Regulations about maintenance. Management System General regulations about the management system of the common. Meetings and convocations Regulations about meetings of the common and regulations on convocation for those meetings. Monitoring Regulations about monitoring and sanctioning by officials and members. Access - Access Rights Regulations regarding access rights (for instance who is and is not allowed to become a member). Access - Admission Fee Regulations regarding admission fees for new members. Access - Shares Regulations concerning (for instance: buying and selling of) shares. Administration - Producing Overview Regulations on producing an administrative overview, for instance a list of all animals grazing on the common subdivided per owner. Administration - Registration of Regulations Regulations regarding the setting down and announcing of rules. Finance - Admission Fee Regulations regarding admission fees for new members. Finance - Governance Fees Regulations on payment of fees for governance. Finance - Payment of Debts Regulations on payment of debts by the common or to the common. Finance - Payment of Rent Regulations on the payment of rent by the common or to the common. Finance - Sale of Lands Regulations regarding the sale of land. Finance - Tax Regulations regarding the payment of taxes by the common or through the common (i.e. not grazing fees). Finance - Use Fee Regulations regarding payment for use of the common (for instance grazing fees). Finance - Wages Officials Regulations regarding the payment of wages to officials (of the common). Maintenance - General Regulations concerning (performing of) maintenance. Maintenance - Procedures Regulations concerning the procedures of maintenance (for instance: convocation, gathering at a specific location and time, and performing maintenance as specified by an official of the common). Management - Appointing Officials Regulations about the appointment of officials for the common. Management - Jurisdiction Regulations regarding the jurisdiction of the common. Management - Regulations General Regulations that state that none of the regulations of the common may be broken, and stipulate a sanction, or regulations that state that all previous regulations are still in effect. Management - General Tasks Regulations about general management tasks. Meetings - Convocation Regulations concerning convocation for meetings. Meetings - Procedures Regulations on the procedures to be followed at meetings (for instance: reading out of all regulations, listing all offences, etc.). Meetings - Voting Rights Regulations regarding voting rights (for instance: who has the right to vote, are decisions taken at a unanimous or majority vote etc.). Monitoring - General Regulations regarding general monitoring tasks (for instance: keep a close eye on the common, report offenders etc.). Monitoring - Inspections Regulations regarding inspections of the common (for instance inspections on waterways, counting sheep etc.). Monitoring - Sanctioning Regulations regarding sanctioning of offenders (for instance: who executes which sanctions). Everybody Regulations regarding everybody, both members/right holders and non-members/right holders of the common. Members/right holders Regulations regarding members/right holders of the common. Non-members/right holders Regulations regarding non-members/right holders of the common. Everyone Regulations regarding everybody, both members/right holders and non-members/right holders of the common. All Members/Right holders Regulations regarding all members/right holders of the common. Specified Group of Members/Right holders Regulations regarding a specified group of members/right holders (which will be specified in Party Specific). Specified Members/Right holders Regulations regarding members/right holders specified by name. Non-Members/Right holders, all Regulations regarding all non-members/right holders of the common. Specific Non-Members/Right holders Regulations regarding specific non-members/right holders of the common (either named or a specified group). Officials in General Regulations regarding officials specified by their function. Officials, Specified by Person Regulations regarding officials specified by their function and their name (if specified by name and function, then specify by function in Party Specific). Assembly of Inheritors Regulations regarding the assembly of inheritors (hereditary members of the common). Assembly of Marke Regulations for the assembly of the marke (Dutch type of common). Higher Authority Regulations regarding a higher authority. Bailiff Regulations regarding the Bailiff, an English official. Bijzitters Regulations regarding bijzitters, persons living within a Dutch common without being a member. Buyers Regulations regarding persons who buy land or resources from the common (only to be used if a more specific term is not available). Inhabitants cabins/cottages Regulations regarding the inhabitants of cabins and cottages (generally those built on common land or owned by the common). Chairman assembly together w Commissioned Members Regulations regarding the chairman of the assembly of the common together with the commissioned members. Citizens Regulations regarding the citizens of a specific location. Children Regulations regarding children (of members/right holders or non-members/right holders). Collector Land Tax Regulations regarding the collector of land tax. Chairman Neighbourhood Regulations regarding the chairman of the neighbourhood. Chairman Assembly Regulations regarding the chairman of the assembly of the common. Commissioned Members/Right holders Regulations regarding commissioned members/right holders, officials that have been appointed for a specific task. Married Couple Regulations regarding married couples. Corporate Body Regulations regarding corporate bodies (only use this general term if a more specific term is not possible). Dijkgraaf Regulations regarding the dijkgraaf, a specific official in Dutch commons. Forest Keeper Regulations regarding the forest keeper, an official of the common. Farmers in General Regulations regarding farmers (only use this general category if a more specific category is not applicable). Grass Men Regulations regarding grass men, officials of English commons. Hoofdman Regulations regarding the hoofdman, an official of Flemish commons. Household Regulations regarding the household. Huisluiden Regulations regarding huisluiden, a Dutch type of farmer. Inheritors Regulations regarding inheritors, hereditary members of a Dutch common. Legal Occupations Regulations regarding persons who practice a legal occupation (such as lawyers etc.). Location Regulations regarding persons living in a specific location (for instance a village, city or specific part of the common). Meentmeester Regulations regarding the meentmeester, official of Flemish common. Mayor Regulations regarding the mayor. Named Persons Regulations regarding named persons (if a rule is related to named officials with a specified function, then fill in the function). Non-shareholder Regulations regarding non-shareholders, persons without shares in the common, but with (limited) use rights. New Members/Right holders Regulations regarding new members/right holders. Poor Chaser Regulations regarding poor chasers, officials of the (Dutch) common that is responsible for chasing off vagrants. Cattle Pounders (schutters) Regulations regarding cattle pounders, officials of the common (known as Schutters in Dutch). Servant/Maid Regulations regarding servants and/or maids. Shareholders Regulations regarding shareholders, persons owning shares in the common. Smallholders Regulations regarding smallholders, persons living in a small house/cottage with a small plot. Schepenen Regulations regarding schepenen, officials of a Dutch city. Sworn Members/Right holders Regulations regarding sworn members, officials that have been sworn in (especially common in Dutch commons). Schaarzetters Regulations regarding schaarzetters, officials in Dutch commons that decided how many animals could be grazed on the common. Tenant Farmers Regulations regarding tenant farmers. Vroentmeester Regulations regarding the vroentmeester, an official of Flemish commons. Widow(er)s Regulations regarding widows and/or widowers. Yes, Active Participation with Offenders Regulations sanctioning persons who actively assist offenders in free-riding. No Regulations without a liability component. Yes, Otherwise Regulations sanctioning persons liable in another manner. Yes, Allowing Offenders passively Regulations sanctioning persons who allow other persons to free-ride without participating. Class of Subjects Regulations sanctioning behaviour damaging to a class of subjects. Community Regulations sanctioning behaviour damaging the community (i.e. the members/right holders of the common) (if it is not specifically stated who is damaged by the offender, it may be assumed that the community suffers). Higher Authority Regulations sanctioning behaviour damaging to a higher authority. Single Subject/Person Regulations sanctioning behaviour damaging to a single subject or person. The values chosen in this field should correspond to the option chosen in the Party fields in the Individual Rules Table. Everybody Sanctioning regulations regarding everybody. Offender is non-member/right holder Sanctioning regulations regarding non-members/right holders. Offenders are group of non-members/right holders Sanctioning regulations regarding a group of non-members/right holders. Offenders are group of members/right holders Sanctioning regulations regarding a group of members/right holders. Offender is member/right holder Sanctioning regulations regarding members/right holders. Offender is official (member/right holder) Sanctioning regulations regarding officials (it is assumed that officials from the common are members or right holders, if they are not, then specify as other). Whenever Sanctioning regulations that are triggered at any time, whether an offence is made or not. Upon Rule Breaking Sanctioning regulations that are triggered when the rule is broken. At Specified Time Sanctioning regulations that are triggered at a specific, time, for instance at an inspection. 1st non-compliance Sanctioning regulations that are graduated, increasing in severity if the offence is committed more often. Choose this value if the sanctioning rule specifies that the sanction is increased after not complying with this first sanction. 1st Offence Sanctioning regulations that are graduated, increasing in severity if the offence is committed more often. Choose this value if the sanctioning rule specifies that the sanction is increased after committing the crime again after having been punished with this first sanction. 2nd non-compliance Sanctioning regulations that are graduated, increasing in severity if the offence is committed more often. Choose this value if the sanctioning rule specifies that the sanction is increased after not complying with an earlier sanction (for instance, refusing to pay the fine, or resisting impounding of animals). 2nd Offence (and onwards) Sanctioning regulations that are graduated, increasing in severity if the offence is committed more often. Choose this value if the sanctioning rule specifies that the sanction is increased after committing the crime for a second time after having been sanctioned before. 3rd non-compliance Sanctioning regulations that are graduated, increasing in severity if the offence is committed more often. Choose this value if the sanctioning rule specifies that the sanction is increased after not complying with two earlier sanction (1st non-compliance and 2nd non-compliance. 3rd Offence (and onwards) Sanctioning regulations that are graduated, increasing in severity if the offence is committed more often. Choose this value if the sanctioning rule specifies that the sanction is increased after committing the crime for a third time after having been sanctioned before. Non-Graduated Sanctioning regulations that are not graduated. Member/Right holder Sanctioning regulations that are explicitly specified as higher or lower when committed by a member or right holder (as opposed to another party). Non-Member/Right holder Sanctioning regulations that are explicitly specified as higher or lower when committed by a member or right holder (as opposed to another party). Non-Differentiated Sanctioning regulations that are not graduated. Official Sanctioning regulations that are explicitly specified as higher or lower when committed by an official of the common (as opposed to another party). Time (day) Sanctioning regulations that are explicitly specified as higher or lower when committed at a specific time of day (for instance: at night). Time (period) Sanctioning regulations that are explicitly specified as higher or lower when committed during a specific time of year (for instance during a specific month, or during winter etc.). Damage on Animals Sanctions levied for offences that (explicitly) cause damage to animals (for instance grazing animals with an illness). Damage through Anti-social Behavior Sanctions levied for offences that are (explicitly) anti-social. Damage through Negligence Sanctions levied for damage (explicitly) caused by negligence (for instance failing to perform maintenance). Damage on Persons Sanctions levied for (explicitly) causing damage to persons (for instance violence). Damage on Resources Sanctions levied for (explicitly) causing damage to resources (for instance cutting up a peat road for the turf). It is often difficult to ascertain whether a rule is designed for sanctioning damage on resources or due to unjustified profits, it is not uncommon that no specification is given, at this point preference should be given to Damage through unjustified profit. Damage through Unjustified profit Sanctions levied for causing damage (to the other members) by unjustly profiting from the common (for instance by grazing too many animals). It is often difficult to ascertain whether a rule is designed for sanctioning damage on resources or due to unjustified profits, it is not uncommon that no specification is given, at this point preference should be given to Damage through unjustified profit. This field is only used for specifying fines. Offence Basis on which the fine is levied is per offence, not taking into account how heavy the offence was (for instance how many animals were grazed above the stint). Quantity-Amount Basis on which the fine is levied is per amount (for instance a fine must be paid for every animal). Quantity-Time Basis on which the fine is levied is per unit of time (for instance for every (extra) day or week that an offence is committed). Animal The fine must be paid for every (additional)animal. Branch The fine must be paid for every (additional)tree branch. Bush The fine must be paid for every (additional)bush. Bundle of willow shoots The fine must be paid for every (additional)bundle of willow shoots. Day The fine must be paid for every (additional)day that the offence was committed. Days of Work The fine must be paid for every (additional)day of work. Herd The fine must be paid for every (additional)herd. Beehive The fine must be paid for every (additional)beehive. Klos The fine must be paid for every (additional)klos (Dutch unit of measure). Load The fine must be paid for every (additional)load. Offence - Omission The fine must be paid for every offence of omission (neglecting to perform a duty). Offence - Transgression The fine must be paid for every transgression (offending by breaking a prohibition). Piece The fine must be paid for every (additional)piece. Rod (Roede) The fine must be paid for every (additional)rod (unit of measurement). Shoot The fine must be paid for every (additional)shoot. Sworn member The fine must be paid for every (additional)sworn member (specific official against whom the offence is made). Transport The fine must be paid for every (additional)transport. Tree Trunk The fine must be paid for every (additional)tree trunk. Confiscation Private Property The offence is sanctioned by the confiscation of private property (for instance by confiscation of the animals that were grazed without permission). The difference between confiscation and impounding is that confiscation is permanent and impounding is temporary. Confiscation Resource Common The offence is sanctioned by the confiscation of the resources from the common that were stolen. The difference between confiscation and impounding is that confiscation is permanent and impounding is temporary. Corporal Sanctioning The offence is sanctioned by corporal punishment. Destruction Assets The offence is sanctioned by the destruction of property (for instance the killing of the animal grazed without permission or tearing down of the cottage built on the common without permission). Exclusion from Commoners’ Assembly The offence is sanctioned by exclusion from the Commoners’ Assembly (loss of political rights/right to vote/speak at assembly). Exclusion from Common The offence is sanctioned by (temporary or permanent) exclusion from the common. Exclusion from Village Council The offence is sanctioned by exclusion from the village council (loss of political rights/right to vote/speak at the council). Impounding The offence is sanctioned by the impounding of the offending assets (for instance locking up the animals, or taking away prohibited tools). The difference between confiscation and impounding is that confiscation is permanent and impounding is temporary. Legal Action The offence is sanctioned with legal actions taken against the offender. Loss of Office The offence is sanctioned by the loss of office (officials loose their appointment). Public Exposure/Shaming The offence is sanctioned by public exposure and shaming of the offender. Payment in Kind The offence is sanctioned by a payment in kind (to be paid in a unit specified in Sanction_Unit). Restoration The offence is sanctioned by forcing the offender to repair the damage he has done. Unspecified The offence is sanctioned by an unspecified sanction, usually in the cases where the punishement is defined as ‘according to the law of the common (‘naar markenregte’). Unspecified Payment The offence is sanctioned by an unspecified fine (the fine is either unspecified (perhaps left to the discretion of the official), or the original document is damaged, wherefore it cannot be ascertained if the fine is monetary, or to be paid in kind). 0.125 ▪ One-eight of the proceeds of the sanction go the party specified in Subdivision_Party. 0.167 ▪ One-sixth of the proceeds of the sanction go the party specified in Subdivision_Party. 0.20 ▪ One-fifth of the proceeds of the sanction go the party specified in Subdivision_Party. 0.25 ▪ One-quarter of the proceeds of the sanction go the party specified in Subdivision_Party. 0.33 ▪ One-third of the proceeds of the sanction go the party specified in Subdivision_Party. 0.40 ▪ Two-fifth of the proceeds of the sanction go the party specified in Subdivision_Party. 0.50 ▪ Half the proceeds of the sanction go the party specified in Subdivision_Party. 0.66 ▪ Two-thirds of the proceeds of the sanction go the party specified in Subdivision_Party. 0.75 ▪ Three-quarters of the proceeds of the sanction go the party specified in Subdivision_Party. 0.80 ▪ Four-fifth of the proceeds of the sanction go the party specified in Subdivision_Party. 0.83 ▪ Five-sixth of the proceeds of the sanction go the party specified in Subdivision_Party. 1.00 ▪ All proceeds of the sanction go the party specified in Subdivision_Party. Not applicable The division of sanctions is not specified. Benefit Common The proceeds of the sanction go to the common, to be used for the benefit of the common. Chairman Assembly The proceeds of the sanction go to the chairman of the assembly. Higher Authority The proceeds of the sanction go to a higher authority. Inheritors The proceeds of the sanction go to the inheritors (hereditary members of the common). Local Government The proceeds of the sanction go to the local government. Persons Present at Gathering The proceeds of the sanction go to the persons present at a specified gathering (for instance a meeting). Members/Right holder The proceeds of the sanction go to the members/right holders of the common. Not Applicable No subdivision of the sanction is specified. Neighbour The proceeds of the sanction go to the neighbours living in the common. Official The proceeds of the sanction go to (a specified) official of the common. Person Reporting Offence The proceeds of the sanction go to the Person reporting the offence. These descriptions are also appear in DESCRIPTION OF THE VALUES USED. Permission* * If the rule is linguistically constructed as a permission, but has a sanctioning rule attached to it, then it is an obligation or a prohibition, and should be coded accordingly. * If the permission is dependent on specific conditions (but without a sanctioning rules) these conditions are to be entered into Rule Primary Condition, Rule Secondary Condition, and Rule Tertiary Condition. Prohibition Regulations prohibiting certain actions for a specific period and/or a specific location (e.g., prohibition to graze animals on the common during part of the season; in case this has been mentioned as: it is permitted to graze for a certain period, enter the option as permission!). Assessors Regulations for the assistant of the chairman of the common. (The Dutch assessors are bijzitters and should be coded as such). These fields may only be used when the rule is a permission. General Remark 1: When changing from one Table or Overview to another, it may take some time to load the new Table or Overview. Please check carefully if the new Table or Overview already has loaded before you continue. General Remark 2: Due to the current lay-out of the system, items may at first glance seem not to appear; since the lay-out exceeds the screen boundaries, these items can be found by scrolling to the right. You will see an overview of the Original Rules entered for the specific common; in case the original Rule already has been split up into two or more Individual Rules, a link will appear before the ID# of the Original Rule, stating ‘Individual Rules’ and the number of Individual Rules already entered for that specific Original Rule. You will see an overview of the Individual Rules entered for the specific Original Rules; in case the Individual Rules already has been linked to one or more Sanctioning General, a link will appear before the ID# of the Individual Rule, stating ‘Sanctioning General’ and the number of Sanctionings General already entered for that specific Individual Rule. You will see an overview of the Sanctionings General entered for the specific Individual Rule; in case the Sanctioning General already has been linked to one or more Sanctionings Specific, a link will appear before the ID# of the Sanctioning General, stating ‘Sanctioning Specific’ and the number of Sanctionings Specific already entered for that specific Sanctioning General. You will see an overview of the Sanctionings Specific entered for the specific Sanctioning General; in case the Sanctioning Specific already has been linked to one or more Subdivisions, a link will appear before the ID# of the Sanctioning Specific, stating ‘Subdivision’ and the number of Subdivisions already entered for that specific Sanctioning Specific.